Our GradGuard team is looking forward to the annual ACUHO-I conference this week in Seattle. The annual ACUHO-I meeting is the best gathering of leaders in student housing and residence life. Given the value of residential life to increasing college completion rates, GradGuard invests in supporting this community of higher education and housing professionals. Given the scope of the programs and activities during the conference, it might be tempting for some to bring a Hoverboard to speed around the conference. 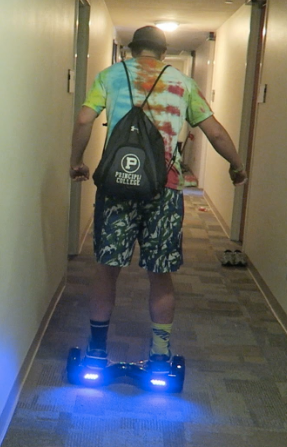 It would be ironic to see Hoverboards at the conference because it was a hot topic on college campuses this year. GradGuard's Steve Fucci - wrote about Hoverboards earlier this year and was wise to observe that every day risks students are an even more common issue that deserves equal attention. In fact, 2014 Clery Act data reported by campuses indicated that more than 13,000 burglaries and 2,000 fires were reported on campuses. Those are large numbers and they don't include theft which is even more common. GradGuard's student benefit and insurance programs contain an exclusive renters liability and property protection coverage that help reduce financial losses to both institutions and families from unexpected events such as theft, burglaries, fire or water damage. Please stop by booth 455 in Seattle to see why more schools than ever are providing a convenient way for residents to receive GradGuard's renters insurance as a valuable and relevant benefit of living on your campus.